Peter Marcotullio is Professor in the Department of Geography, Hunter College, City University of New York (CUNY). He also holds the Directorship of the CUNY Institute for Sustainable Cities (CISC) and is faculty member in the Earth and Environmental Sciences Program at the CUNY Graduate Center. Dr. Marcotullio moved into the Department of Geography from a Distinguished Lectureship (2007 – 2009), where he taught in the Department of Urban Affairs and Planning, the Department of Geography and in the CUNY Macaulay Honors College. Over the last decade, Professor Marcotullio has also been an Adjunct in the Urban Planning program, Columbia University, Graduate School of Architecture Planning and Preservation. Prior to coming to CUNY, he was Lecturer and then Professor of Urban Planning, Urban Engineering Department, University of Tokyo (1999-2006), and held several positions at the United Nations University, Institute of Advanced Studies, Japan (1997-2008). 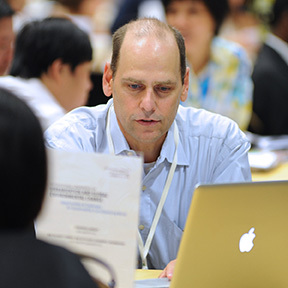 Besides research for the United Nations, Professor Marcotullio has also participated in several global international studies. From 2001-2005, Professor Marcotullio participated in the Millennium Ecosystem Assessment as a Coordinating Lead Author (CLA) of the Urban Systems chapter. He was a CLA for the Global Urbanization and Biodiversity section of the Convention on Biological Diversity (CBD) First Cities and Biodiversity Outlook report (2011-2013) and Contributing Author (CA) to the Human Settlements, Infrastructure and Spatial Planning chapter in the International Panel on Climate Change (IPCC) Fifth Assessment Report (2013-2014). He is currently CLA for the Urban Energy Supply Systems chapter for the 2nd Global Assessment Report of the Urban Climate Change Research Network (ARC3-2) and a member of the Scientific Steering Committee (SSC) of the International Human Dimensions Program’s Urbanization and Global Environmental Change (IHDP-UGEC) project. Prof. Marcotullio holds a MA in Biology from the University of Pennsylvania and an MA in Geography and a PhD in Urban Planning from Columbia University. He has published five co-edited volumes, over 35 book chapters and over 40 peer-reviewed journal articles. He is an editor of the journal, Sustainability Science.